This is it. The most iconic building of the Chicago skyline. (Bueller? Bueller?) 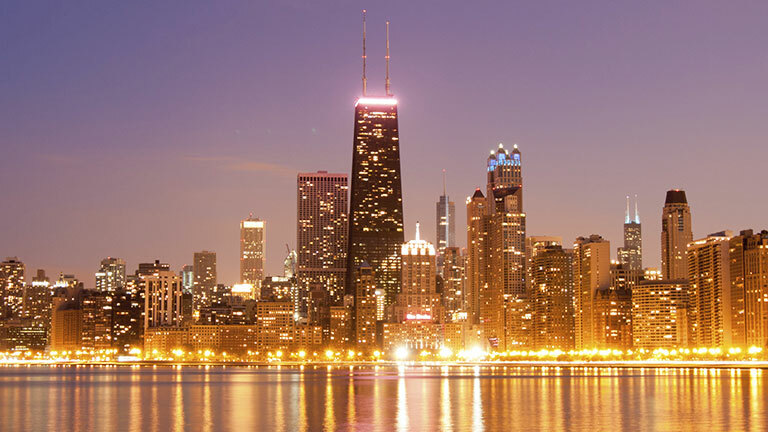 You've seen it from afar, now head to the top, more than 1,300 feet above the Windy City. Hop on one of the world's fastest elevators, and feel your stomach drop at speeds of 1,600 feet per minute. The Skydeck is your final destination, on the 103rd floor of the Willis Tower Chicago, the tallest building in the Western hemisphere. Check out four states with viz of up to 50 miles on a clear day. Feel the earth moving? Yeah, that's supposed to happen. Engineers built in a sway of up to three feet to handle those Lake Michigan breezes. Take it all in, but don't settle for a standard selfie. Venture out onto the Ledge's glass boxes that extend 4.3 feet from the Skydeck. Click. Post. Boast. $22.00 for adults (ages 12 and up), $14.00 for youth (ages 3-11); children under 3 are free. Open 365 days a year. March through September, 9:00 a.m. to 10:00 p.m.; October through February, 10:00 a.m. to 8:00 p.m. Last entry is 30 minutes prior to close. When is the best time to visit Willis Tower? Anytime is a good time to check out a bird's eye view of Chicago and the surrounding states from the Skydeck. But for a really unforgettable experience, time your visit around sunset for spectacular views. Plan to arrive at least 30 minutes before sunset to find the best spot, then sit back and wait for something amazing. You can also arrange special early-bird viewing and grab a spectacular sunrise over Lake Michigan. Check out the Breakfast Like A Vip packages for full deets. What can I see from the chicago Skydeck? To infinity and beyond. Ok, maybe not quite that far, but how does four states on a clear day sound? Even when weather conditions aren't perfect, you can take in amazing views of Lake Michigan and downtown Chicago. Step out onto the glass floor of the Ledge boxes. What are those tiny specks below your feet? Oh yeah, people on their way to work or shopping on the Magnificent Mile. Honestly, once your heart stops pounding out of your chest, you have pretty unlimited viewing options. Check it out!